Proceed with the blueprint recipe, adding the honey before the water. Remove from the fridge, tip onto a lightly floured board and fold the dough per the blueprint recipe. Cover and leave for 45 minutes. Preheat the oven to 250°C (remember the cast iron pan at the base). Brush a baking sheet with olive oil, tip the dough onto a lightly floured board and cut the dough into pieces of about 70g each. 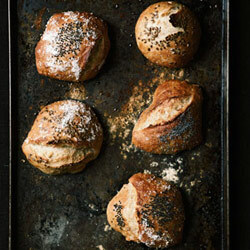 Place these rustic shapes on a baking tray; sprinkle with seeds and wholemeal flour. Cover with a cloth and leave to rise for 30 to 45 minutes. Working quickly, slide the rolls into the oven and add 120ml water to the cast iron pan beneath. Shut the oven and bake for 15 minutes or until dark golden. Immediately remove from the tray and cool on a wire rack. Reprinted with permission of Women's Health July Issue.